Fresh water fish like Cherumeen and Pallathi ( Orange chromide) are usually used to make pickle back in my mom's place in Kuttanad , where it is available abundantly year round. And fried Roe(palinjeel) from cherummen used to be a wonderful snack for us in the evening. 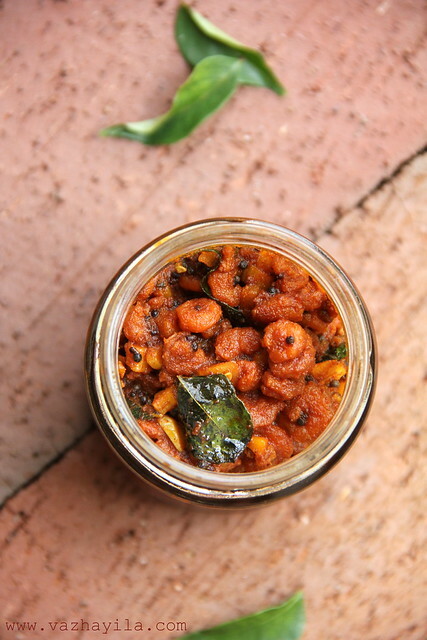 I still remember during our summer vacations , the maids would be busy cleaning and marinating the giant fish or the small ones like pallathi and leaving it out in the sun to dry for 1-3 days, sometimes we kids were asked to guard it from crows and hens; and Ammachi making pickle , which is very different from my recipe here today. Thats the best , and i m sure i will have to practice it a million times , to get it right. 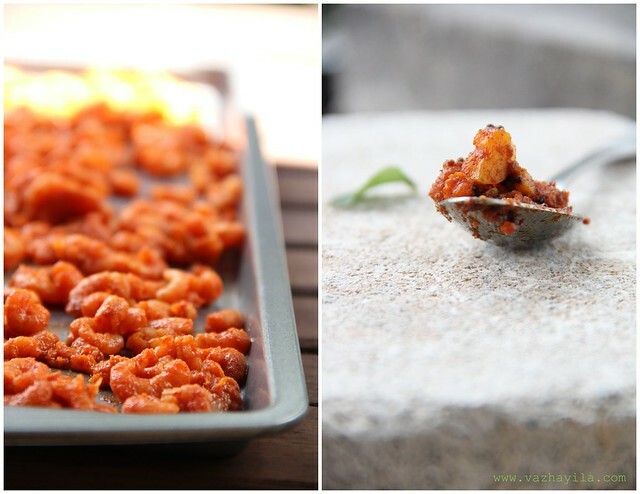 In this recipe here , i have used teeny tiny shrimp , like the Konju we get back home , following the basic family recipe for any red colored pickle. I sun dried it nearly for two days and couldn't resist the urge to make it and eat it. Its always a big hit with beer or any other drinks. Total cooking time - 1 or 2 days to dry and 30 minutes to make. If using fresh shrimp , clean , devein it and wash it thoroughly. I used frozen cooked salad shrimp , so i just thawed it overnight in the fridge . Marinate it with all other ingredients in Bowl 1 , arrange it on a tray or cookie sheet and leave it open in the sun for a day or two. I keep it from 10.00 am to 4.00 pm for nearly 2 days . Every evening take it inside ,leave it on your counter top , covered or uncovered. Grind all the ingredients in Bowl 2 to a fine paste. Sprinkle a table spoon of water if necessary. Heat some oil from the fried shrimp pan , or you can use nalenna / sesame oil for this step. Stir in the fried Prawns and combine well , Saute for 3-4 minutes, till it is heated through ( add fenugreek powder if you are using it now ) Give a salt check . Switch off the flame . Let it cool. When it is in room temperature add hing and 2 more table spoon of vinegar (optional) and mix well. My mom leave it on the stove top for a day and then transfer it into glass jars. Pour 2 or 3 table spoons of Nalenna/ Gingelly oil over it and keep outside for a day or two and then keep refrigerated . I use the smallest salad shrimp available and if you are using big shrimp , cut it into small pieces. To expedite the process you can bake the marinated shrimp , till it is dry or even it is brown and fried and omit the sun drying and frying part. If you are gonna use it up within 2-3 days , you can substitute lemon juice for vinegar. This recipe is a dry version and if you want a bit gravy with it add more water and vinegar. Always take pickle with clean spoons. Adipoli chemmeen achar..mouthwatering one..pass me the whole bottle,lovely clicks..
My eldest sister would love these, buti was never a fan of chemeen and earchi pickel. Delicious spicy pickle I would love to have it with some porridge. Which is your camera...Its just superb clarity & have amazing crispness...Canon?? Tempting and looks so yum! achar kandittu kothi sahikkan vayye.ichiri ingu ayachu tharumo? @ Loveandcalories....Thanks a lot abt the pics..
Heard about this pickle for the first time. it looks yummy!! Dhey veendum kodipikunnu....why did you have to live 7000 miles away?!!! Ente bro vannapol my grandma had send me vatta manga achar... and now I wish she'd send me some chemmeen too. Sigh. Guess I'll have to make it myself -- hey girlie, did you use fresh or frozen shrimps..? entamme.. sherikkum kappal oodikkan ulla vellam aayi vaayil.. vishakkmbol blog hopping nu erangaruthu ennu manasil aayi.. Gonna try this out for sure Sarah.. I used to have this pickle when my friend used to get to our hostel..thanx for bringing back the lovely memories....this sure looks yummy and very tempting..
Love,love your pictures and that dish looks absolutely delicious! Mouth watering here.Looks so tempting & nice colour too. Looks very good. Ages since I had some homemade achar.. yum! alright, sarah, this u have to send one jar to my house.. else..
so salad shrimp... let me try with that..
truly mouth-watering! this is awesome! 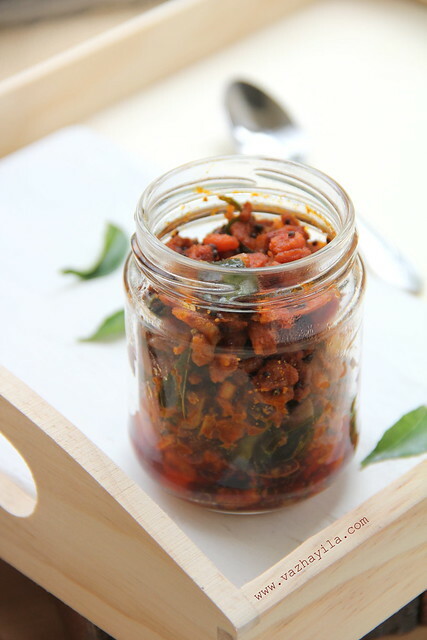 Seriously am drooling over that addictive and irresistible prawn pickle,i can have this yummy pickle with anything.. I love all the ingredients you have used in the pickle..looks amazing and sounds fantastic..great recipe!! Fab looking & tongue tickling achar!!!! kothipichu kollanano udesham..control vittu,vayil vellam varunu..
i love this...iam very poor in making pickel ..but my mom.....she is very expert..
What an interesting recipe. I think I've seen prawn pickle before, but since S is allergic, never had it. And as always, your pics are GORGEOUS! Pictures r as always so perfect Sarah. One of my fav pickle..Oohh looks so yummy..Mouthwatering! wow..lovely recipe! 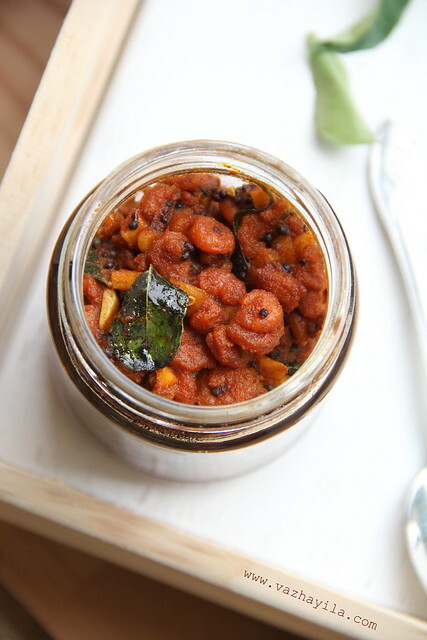 have u heard of Mango Murabba?..is a northindian mango pickle...Can u post the recipe for me? waiting to hear from u! Absolutely fab dear. Loved all snaps. Kanditt kodhiavunnu. With hot steaming rice this will be mindblowing. Beautiful pics, gorgeous presentation n a great recipe!! Pickle looks spicy, fabulous, yummy and tempting. Gorgeous presentation. Love the simplicity of your recipe and shall surely try it out. I too write a recipe only blog on skilletnwok.blogspot.com. I have recently started writing it, do have a look! I liked the part about the lifespan of this pickle. Mothers and grandmothers in Kuttanadu are yet to find that out.